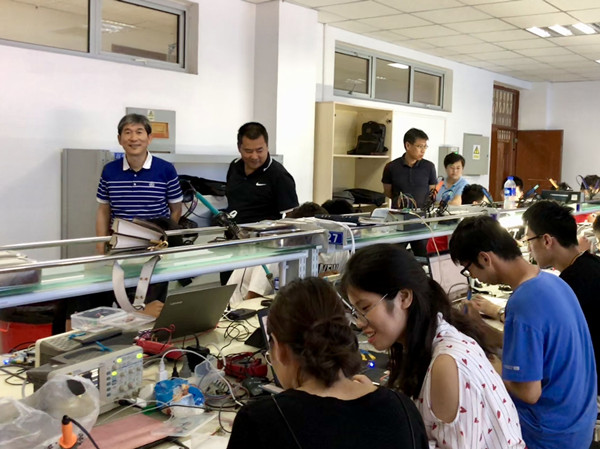 [News from the News Center] On the afternoon of June 24, the YSU Embedded Electronic System Design Competition hosted by the School of Electrical Engineering was held at the Electronic Experiment Center of the School of Electrical Engineering. The competition received strong support from the Academic Affairs Office. A total of nearly 200 students from 97 teams from the School of Electrical Engineering, School of Information Science and Engineering, School of Science, School of Materials, and School of Environmental and Chemical Engineering participated in the competition. Students are in the competition. The competition adopts a semi-open time-limited mode, which focuses on assessing contestants’ the comprehensive practical ability in using the knowledge they have learned to design the embedded electronic system software and hardware. It requires two participants to complete the hardware design, software programming, performance testing and other tasks required by the competition. The competition referee scores by the completion degree and completion efficiency according to the task requirements. In the competition, the team composed of Wang Hongzhi from the Class of Biomedical Science 16-1 and Zhu Feiwang from Applied Econics 16-2 completed all the questions in 2 hours and 23 minutes. The competition set up an innovative competition platform for students, fully embodying the concept of the integration of teaching and competition, which is the effective practice of students' innovation and entrepreneurship training mode of the School of Electrical Engineering. Meanwhile, the competition lays a solid foundation for innovation and entrepreneurship training program, "Internet + " University Innovation and Entrepreneurship Competition, College Students Electronic Design Competition, and College Students' Smart Car Competition.